Crafts by Beth: "Performs related duties as assigned." .....turn a bus into a boat. This is what happens when your employer knows you can sew. Under this ship is an ENTIRE BUS! 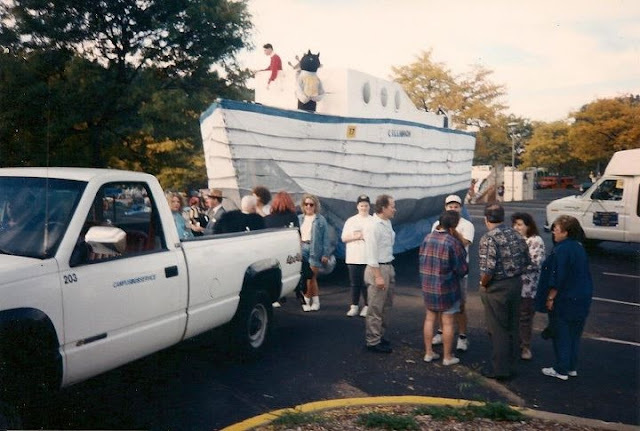 This boat float was made in the mid 1990's. Praise the Lord they didn't make me dress up as Gilligan. I worked in the Campus Bus Service Department. Every other year or so, we gutted the inside of a bus that was no longer usable and created a float for the Homecoming Parade. Our first float was the magic lamp from the movie Aladdin. We paper mached a bus that was wrapped in chicken wire - what a mess that was. We also created space shuttle and diner restaurant. Phew....glad those days are behind me. The moral of the story: Keep your mouth shut!